Near Fort Smith, Arkansas, Zero Mountain Cold storage was founded in 1951 with little more than a limestone cave and a dream. In 1955, the company opened a sub-zero storage and processing vault for frozen loads. The move was just on time, as the poultry market was on the verge of exploding, with large processors located nearby in Western Arkansas. As it exhausted its underground capacity, the company opened aboveground in the 1980’s with multiple locations to serve growing demand. Zero Mountain is an elite cold storage and logistics service provider today. It ships more than 2 billion pounds of frozen food and meat every year to a diverse customer base of Fortune 500 companies. The growth was still in full swing in 2015, when the company needed more storage and processing space to build out its national logistics supply chain near its Fort Smith headquarters. Because there is a high cost to frozen storage, every inch of space is critical. The company approached Cisco-Eagle, Inc. to help it plan and implement the new facility. Zero Mountain needed to increase storage capacity at its Fort Smith, Arkansas facility to accommodate its growing customer base. This irregular landscape was a design and workflow challenge for Rumsey and his team. They did not have the luxury of simple cubic space on a flat green field. “We built one side on a sloping angle,” Rumsey continued. “We felt we could make it work.” The challenge was to work in that configuration while maximizing that expensive frozen and cooler space—all without compromising efficiency. Two areas had to be considered in this solution—the new cooler area, and the frozen storage warehouse. 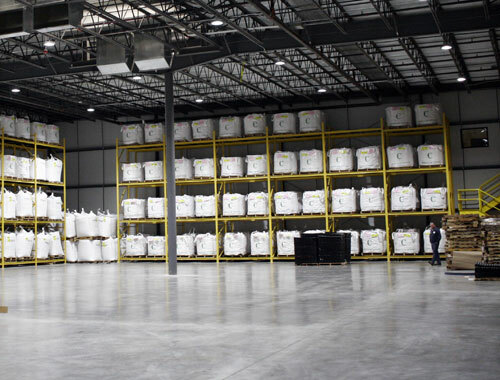 This resulted in 71,000 square feet of cooled/frozen storage space that holds more than 8,000 pallet positions, and another 300 pallet positions for enclosed blast cells, where product is flash frozen at -30°F. Because storage density was critical in the frozen storage warehouse, Zero Mountain opted for drive-in racks. 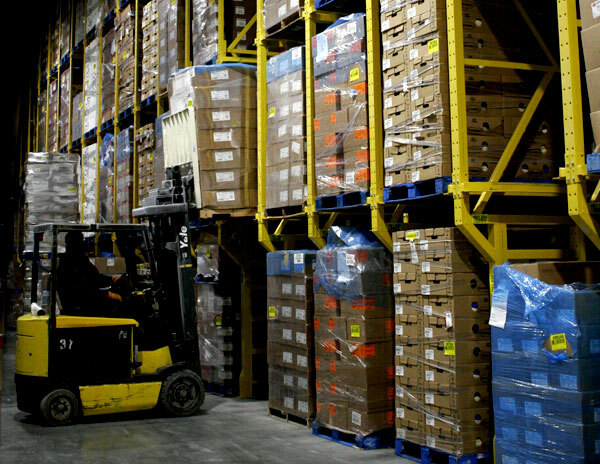 Drive-in systems reduce the number of picking aisles, meaning that they handle up to 75% more pallets than selective racks. It’s ideal for cold storage, cool storage and high-traffic operations where selectivity isn’t as critical. Steel King SK3000 drive-in rack was specified for the freezer project, as it accommodated Zero Mountain’s needs—up to 4,000 pound loads of frozen poultry. The system also had to support the weight of overhead HVAC machinery in each of the company’s six rack-supported blast cells. SK3000 is a bolted rack with structural channel columns, fully capable of these types of demanding projects. With drive-in rack, forklifts drive directly into the rack to allow storage of two or more pallets deep. 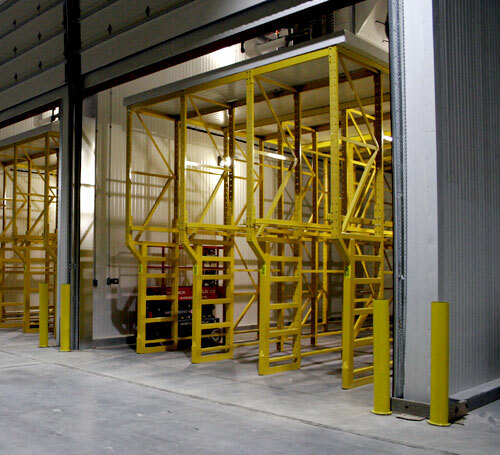 Due to the fact that drive-in racks require forklifts to drive into deep storage bays, they are more frequently hit by the lift, and are abused by the process. Roll-form racks are not as resistant to forklift damage, a critical concern for Rumsey and his team. “It’s structural and can take more damage from a forklift,” said Amanda Miller, Cisco-Eagle’s project engineer. 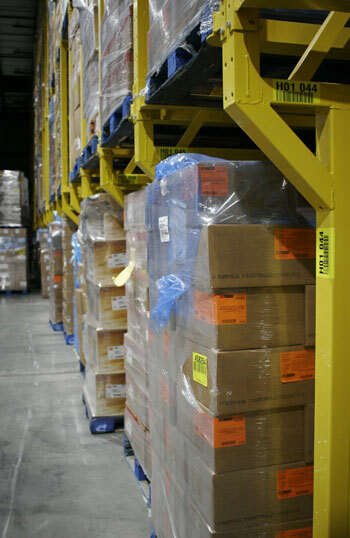 The racks varied from two to nine pallets deep in the Zero Mountain solution, depending on the needs of the area. Also, pallet opening heights were critical: some storage areas required 100” tall pallets (usually for retail), while others required 2,000 pound capacity pallets double-stacked for export business. 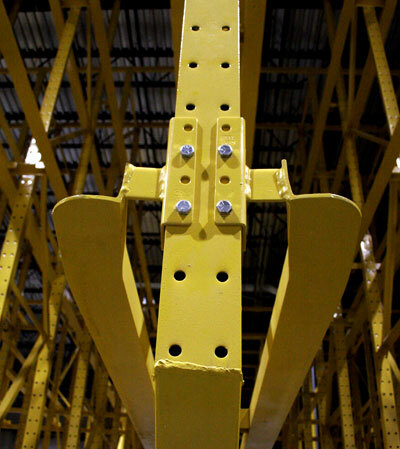 For strength, the drive-in load rails are built with tough structural angle steel and a flared entry design that eases bay access and minimizes potential forklift impact. Space-saver low-profile arms increase clearance and decrease possible product damage. Welded rail stops also improve safety by preventing loads from being pushed off the racks. To further increase rack clearance and reduce forklift impact with the rack, Zero Mountain selected an offset leg design option. “The structural drive-in rack provides us with the strength, capacity and durability we need to withstand decades of use, where forklift impact is expected,” says Rumsey. For 600 pallet positions of additional cooler storage, Zero Mountain opted for a two-deep pushback rack arrangement around the perimeter of the dock storage area. Pushback pallet rack offers up to 90% more storage than selective racks and up to 400% more selectivity than drive-in racks. Unlike static, single-pallet-deep selective racks, a dynamic pushback rack system allows pallets to be stored 2-5 deep while providing access to a variety of different SKUs. 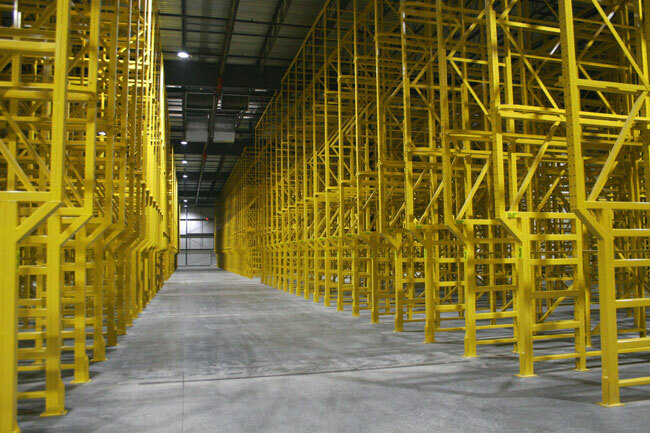 Pushback racks store pallets behind each other in nested carts, which also helps reduce the number of needed forklift access aisles. Pushback and drive-in rack share a common characteristic, in that they utilize a “last in, first out” storage dynamic, which prioritizes density over selectivity. A closer look at the drive-in rack heavy upright frame construction. Heavy duty pallet rails can accept very heavy loads. 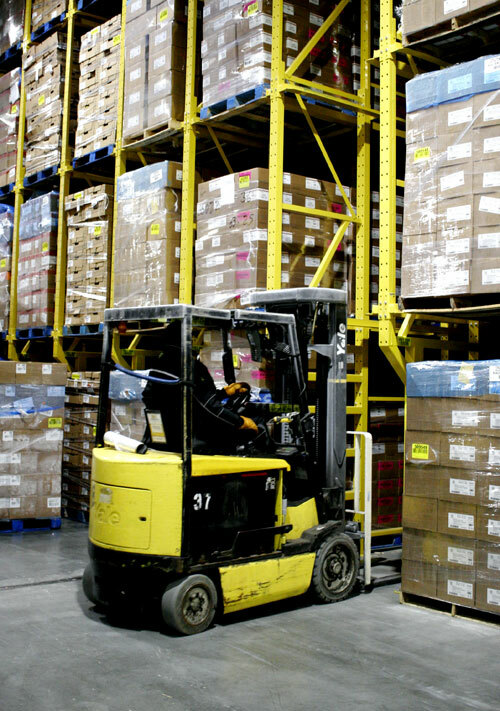 A forklift begins to enter a storage lane to pick a pallet for processing.